I have fond fond memories of passing out Valentine's at school. I would pick up your standard themed valentine's at the grocery store (I probably had Hello Kitty more often than not) and then ever so carefully read through all the different phrases. I made sure to give the best ones to my crushes. Wrote their name on the envelope, taped on a heart shaped sucker, and bam! done! But now we have Pinterest, and the options are endless. I knew Liam was going to love exchanging Valentine's. I wanted to have him help me make something that he would be excited about. First, we did two special ones for his teachers, because apparently we are the brown nosing type. Nothing wrong with that. 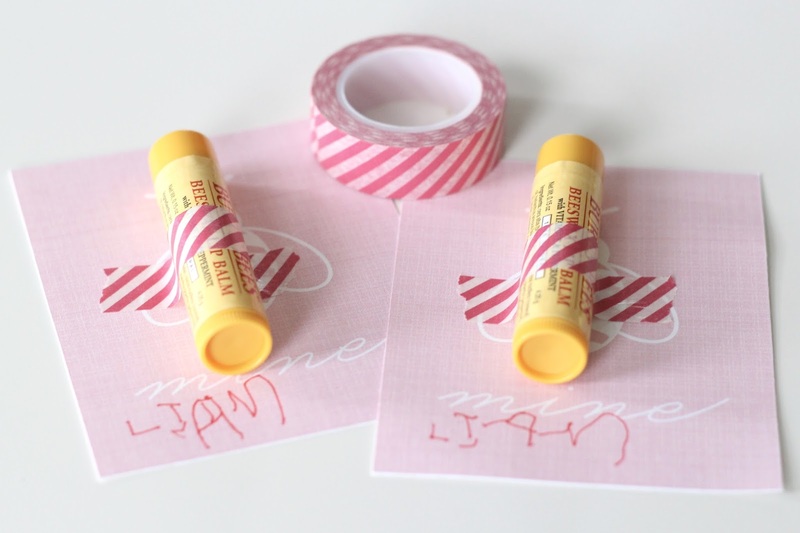 Burts Bees chapstick and a bee mine printable, perfect! I really would have loved to have given everyone this Valentine, but that is some pricey chappy when you look at buying 20 plus! Liam's school has a no treat policy, so I had to avoid all the adorable goodies. Instead I found a few different car Valentine's that I liked. I took some different ideas and designed my own using PicMonkey. Matchbox cars cost about $1 each, or you can hit up the dollar store and typically find three packs of cars for $1. Liam's teacher emphasized that she wanted the kids to write their names on the cards (as opposed to having it typed out) as it would be good practice. 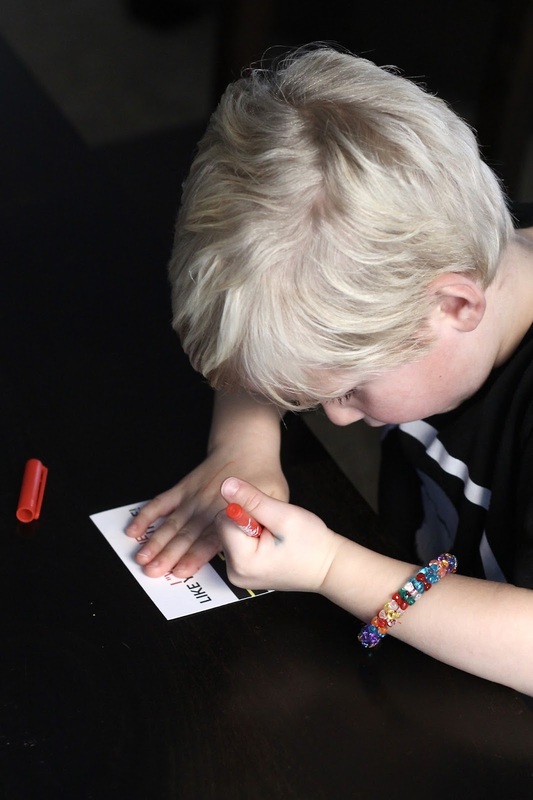 Liam just recently started writing the letters of his name, but was pretty hung up on the "A" for awhile. Well he mastered that damn "A" just in time to sign all his Valentine's. He was so proud of his work. He did all twenty in one sitting and seriously would have kept going. We made a special trip to Papersource for him to pick out some Washi tape. A job he took extremely seriously. Then of course he wanted to tape them all by himself. Somehow I weaseled my way into at least helping. Preschool Valentine's are supposed to be a Mom's project right?! We only get a few years of this! I kid...but I seriously loved it just as much as he did! I love how they turned out! The washi tape didn't hold the cars down as well as I had hoped, so in hindsight I might sacrifice the pretty tape for something more durable. I helped out in Liam's classroom the day of the big party, so that I could see all the kiddos in action. Conor was able to work from home and watch Finn, which made it feel like a party for me too! Having a presence in Liam's classroom is so important to me. I love meeting all his friends and some of the other moms. He just shines at school, which makes for one proud mama. I'm already excited about next year! We'll see how I feel when I have multiple kids all needing to get Valentine's put together, but for now, I love it! SO cute!!! If we didn't have as many valentines as we did, I would love to do the cars for his class! There's like 30+ kids so it would have been slightly more pricey than I'd like, but I love the idea. Maybe if you do it again, you could use regular tape first and then do pretty washi on top so it's still pretty but stays put? 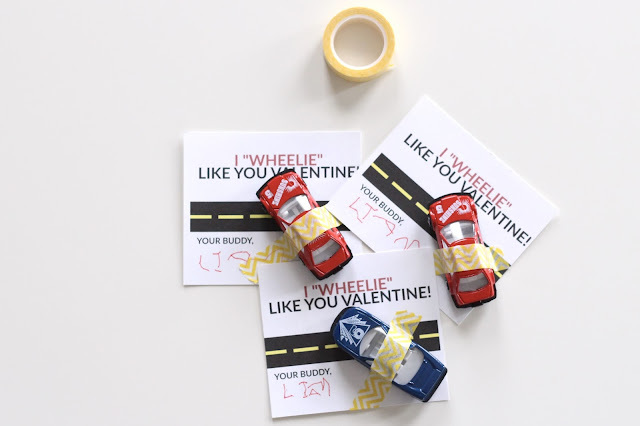 I love this Valentine.... Noah would love to get (or give) a matchbox car! These are the kind of valentines that make me sad Noah's school has a card only policy! 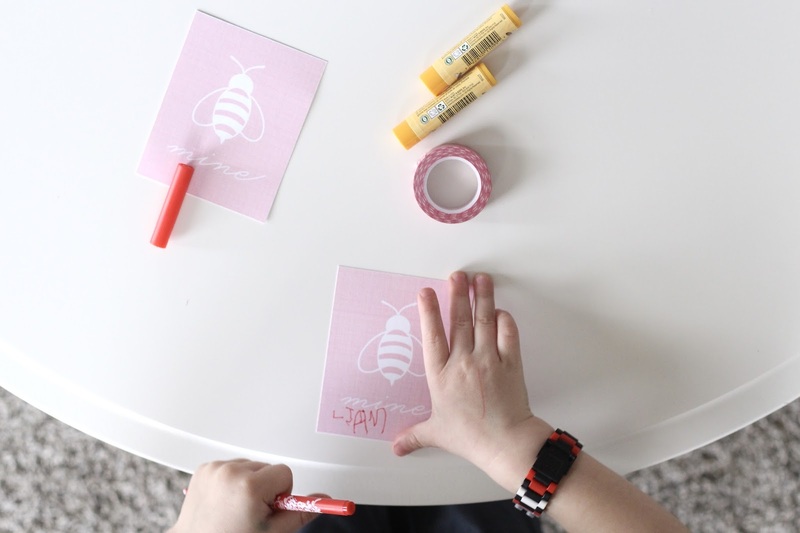 We did "Bee my valentine" cards with Burt's Bees for Cam's teachers too. Love it! The car valentines are awesome! Great idea! these are adorable!! and pretty genius making the kids sign their own names (lex is hung up on the "x" for some reason?). i LOVE liam's cute little printing!! Awesome idea! Such a special activity to be able to do together. And yay for Liam spelling his name so well. These are all too adorable! I love all the cute little ideas! such a cute idea. i love it. palmer can't get past writing the P. she writes it then has absolutely zero interest in doing the rest. These are so cute! You did a great job coming up with these! So stinking cute!! I love that he wrote his own name on them! Mac was supposed to do that too, but gave up after doing 2 and only getting 3 letters in. Womp womp. Kid hand writing is one of my favorite things about being a preschool teacher! So cute! Your valentines are adorable, I love Burt's Bee chapstick. The chapstick is such a great idea! I wish we would have thought of that for Marcus' teachers. I'm loving that your school requests non-candy/food Valentines. Best idea ever. Lastly. Liam is doing awesome with his name. Way to go, buddy!! Adorable Valentine's!! I have to say I'm a fan of the treat-free type. And AWESOME job writing his name, I love that he's so into it. These are the cutest! My mom helped make homemade Valentines for a few years and I loved having ones that were completely different from all the other kids. It's definitely a tradition I want to continue! Writing his name! So cool. Love that he really helped. I could barely talk Aria into putting a few stickers on the envelopes for me. We did a version of the Burt's Bee's Valentine's too! I love the print you attached yours too. And we did the car Valentines in Preschool! They were a huge hit. So cool that he's writing his name!